Organising a Wedding in Suffolk? The marquee and the great British summer wedding go hand in hand. There’s something about the sun shining, a big stretch of white canvas, a dance floor and open countryside that create a special wedding occasion. If you would like to learn more about our marquees, get in touch on 01953 882 394. Our marquees are 100% waterproof. We can provide everything you need to make sure your day is perfect. 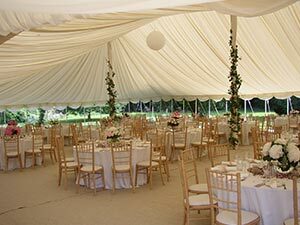 As well as your lined marquee, we can provide flooring, bars, toilets, dance floors and even air conditioning/heating. There are plenty of styles to choose from too, with everything from traditional tents to sleek and modern designs.